“Leo is a very excitable dog. Yes, he is very, very cute, but his high-pitched barking and running around the house every time doorbell rings or a car comes up the driveway can get old very quickly. I have taken him to several different obedience classes so Leo knows the basic commands but he forgets everything once he reaches the state of high excitement. From the first day you came, you have taken time to get to know my dog. You listened carefully, observed patiently and really understood his personality and our family dynamics, and pointed out things that I wasn’t even aware were happening. Then you devised a plan, breaking it down into small steps so it could be achieved realistically. Your understanding of dog behavior and behavioral issues and your consideration in treating them is what makes you an outstanding trainer in my opinion. I had used a remote collar before, because my vet recommended it to help cure Leo’s barking, but I stopped using it after just a few days…you took time to explain to me how to use it properly and checked on adjusting it to the right settings very patiently. I cannot believe how well this tool works when used in the right way! Leo doesn’t wear the collar all the time now, but his behavior on and off the collar has improved dramatically. Never once was aggression a problem with the collar and Leo really doesn’t mind wearing it, because he has learned that putting on the collar means going out! Here is Leo’s story… Leo is an adult Maltese with a very annoying habit of incessantly barking at people who entered and exited the home. His owners were frustrated by his high pitch bark that would last up to 15 minutes after someone entered the home. Leo was previously enrolled in a group obedience training class with another trainer, but that was ineffective in helping to address this issue. 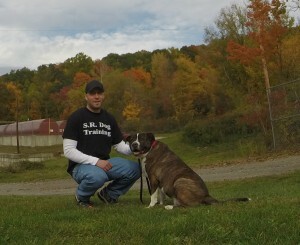 As a result, his owner contacted me for obedience training and dog training Briarcliff Manor NY. There was also a distinct pack structure issue within the household. Leo respected and listened to his female owner, who is his primary caregiver. However, he did not respect or listen to the children and husband within his family. This lack of respect and feeling that he is above the other family members led to bites and aggression toward family members. If Leo is being held by his female owner or on the couch/bed with her, he would growl and try to bite anyone who would approach. This has caused a lot of concern and stress for his family (and rightfully so). Issues like this occur in little and big dogs all over the world…often times resulting in dogs entering shelters. This is why I find my Guidelines for Dog Owners to be so beneficial for owners to understand and implement. If you are in need of dog training in Briarcliff Manor NY or anywhere else, make sure to utilize safe and effective dog training principles that are successful with all dogs…regardless of breed, age or size. We trained Leo to an off-leash level of obedience training using a remote collar as a communication tool. Leo’s owners can now reliably have him “Come” when called, and stay in a “Down” or “Place” regardless of distractions. Learn about the 5 Obedience Commands to Make Your Life Easier. “Mika came to join our family by chance. We already had a Maltese, Leo, who loved to be the center of attention in our family (and whom Steve has helped train before)! This past summer, however, we were on vacation in Japan when we happened across a shy, quiet Chihuahua in need of a home, and we made the decision to adopt her. Mika is the calmest dog that we had ever seen, and we instantly fell in love with her. But beyond the logistics of bringing her home with us (a 13 hour plane flight! ), we were most concerned with introducing her to our other dog. After deciding to adopt Mika, we emailed Steve right away, and he was always quick to respond to address our concerns. Based on his past knowledge of Leo’s more outgoing nature, he helped us develop a plan to keep the two dogs separated and slowly get them comfortable with each other. His thoughtful advice really assuaged our worries about bringing Mika home, and Steve was present in person when the two dogs first met. 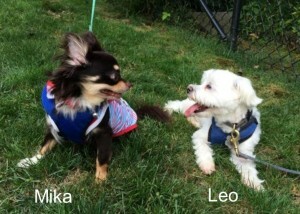 We are extremely happy to say that Mika and Leo get along perfectly well now. In addition, Mika had never been potty trained and didn’t know any commands. She is much more shy than Leo was, so Steve showed us different ways to get her to come out of her shell and respond to us. It was a very different experience from training Leo, who we have had since a puppy, and Steve tailored his approach to Mika accordingly. Nowadays she rarely has accidents in the house and she is able to listen to commands. She has also become much more playful and generally seems to be enjoying life here in America! 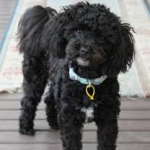 Riley is a 7 year old Shih Tzu/Poodle mix with a variety of issues that his owners were struggling with on a daily basis. Riley was never fully housebroken, which contributed to her having bathroom accidents in the home on a daily basis. Riley also bit and showed aggression toward new people and dogs who entered the home or he would meet on walks. These were very frustrating and concerning issues, which prompted his owners to seek my help with dog training in Briarcliff Manor NY. We first determined that the bathroom accidents were due to insufficient housebreaking as a puppy, not an underlying medical condition. From there, we focused on implementing a practical housebreaking plan that his owners could carry out. Learn about Housebreaking. Addressing aggression and obedience training in Briarcliff Manor NY with little dogs, is no different than handling aggression or obedience training in large dogs. We created and implemented a custom training plan that was geared toward teaching Riley how to properly meet and interact around new dogs and people. We taught him essential obedience commands and rewarded the positive behaviors we wanted. Riley also lacked experience walking on leash in public situations. As a result, he would bark, lunge, and growl at people and dogs. To solve this, we went over proper leash walking technique so his family can take him for less stressful and happy dog training walks in Briarcliff Manor NY. The key to successful dog training is to help owners focus on the important aspects that will help life become less stressful and happy for them and their dog. There is no need to waste time and energy on useless obedience commands and group classes that will not create results in real life situations.